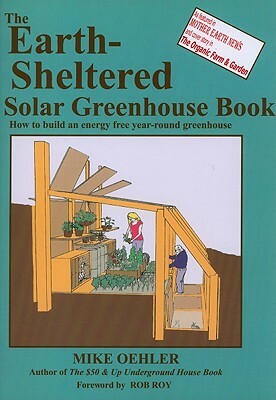 The Earth-Sheltered Solar Greenhouse Book is similar to Mike Oehler's The $50 Underground House Book, with all of the usual self-published pros and cons. I was a bit more disappointed in the greenhouse book than in the earlier text because I felt the former used large print to extend the page count, and the typos were a little excessive. But it was interesting to see how the author built a greenhouse for $400 using the same techniques he uses to make underground houses. 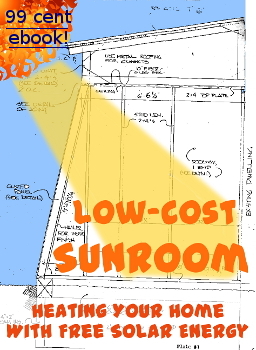 (He estimates a greenhouse built using his methods and new supplies would instead cost about $1,250 for a 32-square-foot grow area.) And I enjoyed the copious illustrations and the anecdotes about happenings at Rainbow Gatherings. On the other hand, Oehler is clearly more of a builder than he is a gardener. His greenhouse book is full of theory, but when it comes to the practical elements, it turns out he's only getting about as much out of his greenhouse as we do out of our quick hoops. Granted, I estimate Oehler lives about one zone colder than us, but if I were to build a greenhouse, I'd want it to do more than provide kale for the winter and tomatoes in early December. Still, I found some greenhouse-building tips to regale you with for the rest of the week, so stay tuned. Start your homesteading journey with easy projects in Weekend Homesteader. I purchased this book last year, as we are intending to build a partially underdround greenhouse. We have the perfect south-south east facing slope for this type of structure. I liked a lot of the pictures and diagrams of various designs, however I was less than enthused about some of the building methods (putting posts inside plastic bags for rot protection for example). I think for me personally if expend all the effort to build an earthsheltered greenhouse I want it to last. I am not sure yet what that means for the greenhouse that I will build, time will tell. I did particularly like the very short section (two paragraphs matbe) that discussed using a long section of buried pipe to heat the greenhouse by pulling air in from the outside via the underground pipe.